A County Fair style festival, complete with judging of vegetables, eggs and flowers; agricultural demos; craft vendors; food vendors and live music!! EDUCATIONAL BOOTHS – Educational Booths are FREE for not-for-profit type entities. Application Deadline is Tuesday, September 18, 2018. Booths must be set-up between Noon Friday to 9:00 a.m. Saturday and taken down Saturday evening after Fair closing. Bring your own tent, tables and chairs with 15 lb. weights / leg – 45 lb. total. Contact Rob Hawk, Extension Director at robert_hawk@ncsu.edu or (828) 488-3848 for more information. FARM PRODUCT EXHIBIT & JUDGING INFORMATION – Adult and youth categories. 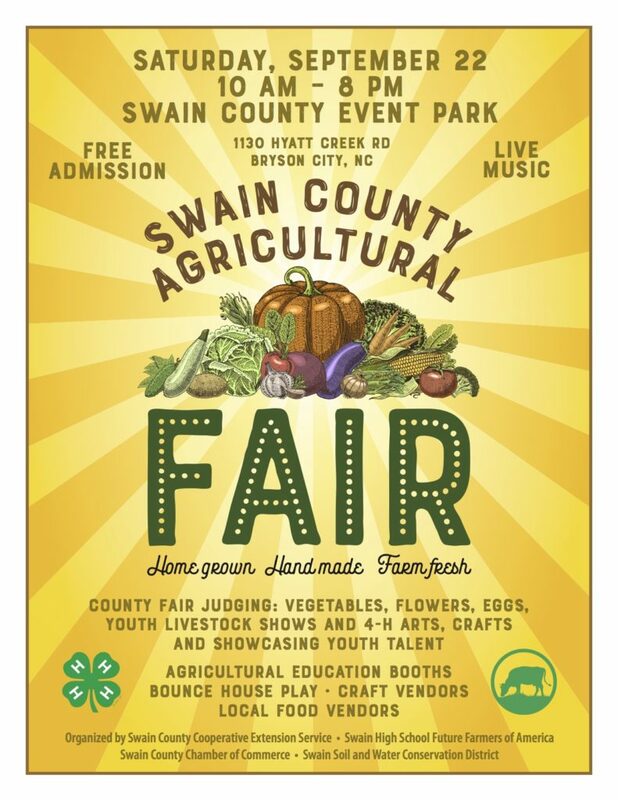 All farm product exhibits are to be entered Saturday morning from 8:00 a.m. – 9:00 a.m. at the Swain Fair grounds. All Farm Product Exhibits will be judged Saturday morning after 9:00 a.m. To sign-up your exhibit and questions, contact Christy Bredenkamp, Extension Horticulture Agent at christine_bredenkamp@ncsu.edu or (828) 488-3848. Youth Fair Arts & Crafts Exhibit & Judging – Youth Divisions include: Non-Competitive for Ages 8 and Under, Non-Competitive for Special Needs All Ages, Competitive for Ages 9-18. Entry Check in 8:00 a.m. to 9:00 a.m. Entry Check out 6:00 p.m. – 7:00 p.m. Ribbons will be awarded. Categories include: clothing, crafts, art, collections, electric, and photography. Contact, Jennifer Hill, Extension 4-H Agent at jrhill9@ncsu.edu or (828) 488-3848. Youth Talent Showcase & Open Mic – Open to any youth (18 & under) wishing to show off their talent. 15 minutes of stage time. Stage available 12:00 p.m. – 4:00 p.m. All categories of talent are welcome and encouraged to participate. Entries must be received by by 5:00 p.m. on September 18. Contact, Jennifer Hill, Extension 4-H Agent at jrhill9@ncsu.edu or (828) 488-3848. YOUTH OPEN LIVESTOCK SHOWS – Entries subject to the Rules of the Swain County Fair 4-H Livestock Shows. Entry deadline is September 14. NO on-site facilities for livestock use (water hookups, electrical hookups, stalls, shavings, etc..) exhibitors will need to come prepared to provide their own or make do without. Contact Kendra Norton, Extension Livestock Agent at kendra_norton@ncsu.edu or (828) 488-3848 for more information. Check-in 8:00 a.m. ~ Judging 9:00 a.m.
Check-in 9:00 a.m. ~ Show 10:30 a.m.